Dr. Greene specializes in Botox®, filler treatments, and laser skin rejuvenation in his Ft. Lauderdale and Boca Raton offices. Browse the information on this page to learn more about these treatments, or contact our office to schedule an appointment. While many patients elect to undergo cosmetic surgery for facial rejuvenation, there is an excellent alternative that can also produce dramatic results. Many patients are aware that Botox® and dermal fillers offer a number of advantages, but most people are not aware of the wide variety of choices available. Because of this variety, it is essential that a patient consults with a surgeon who both understands and is experienced in the use of all of these treatments. A treatment plan customized for each patient is essential in order to achieve the natural and younger, livelier look that patients seek. Dr. Greene has extensive experience with sculpting the face using Botox® or Dysport®, injectable fillers, and volumizing treatments. Whether you are looking for a rejuvenating alternative to a facelift, enhancement of the lips or cheeks, or simply a Botox® treatment, you will soon understand why Dr. Greene is considered by many to be a leading expert in the field. His artistic sense, vast knowledge of facial anatomy, and experience combine to produce exceptional results. His customized treatments often involving a combination of these injectable treatments are the key to obtaining extremely rejuvenating results. When considering your surgeon for injectable treatments, you should select based on experience and expertise. Dr. Greene has published and lectured extensively on injectable fillers, and he was a contributing editor for a textbook on Botox® and hyaluronic acid fillers (Restylane® and Juvederm®). It is also important to note that Dr. Greene administers ALL treatments in the office. With so many choices of fillers available, how does one choose which one will produce the best result? Answering this question is the key to achieving a result that pleases both the physician and patient. With so many inexperienced injectors currently treating patients, many of them have only been trained to use one or two different filling agents. This usually leads to many dissatisfied patients, as many of the fillers are best suited to certain areas of the face. Worse yet, many of the filling agents can produce very unnatural results if placed in certain areas of the face. Dr. Greene takes great pride in how comfortable his patients are during injections. He has developed special techniques over the years that ensure that the treatments cause little or no discomfort. Injectable treatments should not be painful. Too often, patients come to our office complaining that treatments they received elsewhere were uncomfortable, with few efforts done to eliminate the discomfort. 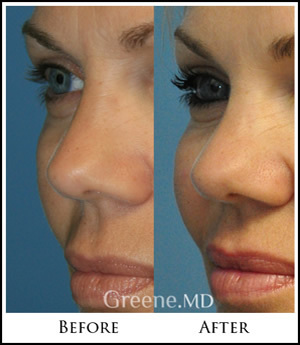 Dr. Greene feels very strongly that an injectable treatment should be a pleasant experience for the patient. He goes to great lengths to make certain that his treatments cause little to no discomfort. From feedback he has received from numerous patients, he has developed a painless treatment system that incorporates specialized techniques and is customized for each treatment. There is very little preparation for a treatment. However, you should avoid using aspirin, non-steroidal anti-inflammatory medications, St. John's wort, or high doses of Vitamin E supplements for one week prior to treatment. These agents could lead to bruising after injection. Also, if you have previously suffered from facial cold sores, you may be prescribed a medication to minimize recurrence. Botox® Cosmetic is a purified protein that is used to eliminate the frown lines between the brows, flatten deep forehead wrinkles, and soften the ‘crow’s feet’ wrinkles next to the eyes. It blocks nerve transmission to the muscles that cause wrinkles of the face. After treatment, the muscles relax, and the overlying skin becomes smooth and unwrinkled. Dr. Greene uses a few tiny microinjections to deliver the Botox® treatments, so discomfort is minimal. The treatment is usually done in about 10 minutes, and there is no downtime. Within a few days, patients see a marked improvement that can last up to 4 months. With so many advantages, it is easy to see why patient satisfaction is so high with these treatments in our office. Contrary to what you may have heard, Botox® does not produce an unnatural appearance with a ‘frozen’ look. An experienced injector knows exactly how to produce natural results that enhance the appearance. For years, Botox® was the only treatment option to address wrinkles of the upper face. Dysport® was recently approved by the FDA as an alternative to Botox®. Like Botox®, it is a simple, painless injection that relaxes the muscles responsible for creating frown lines and facial wrinkles. Dysport® has been used in over 100 countries for over 20 years. Hyaluronic acid is a natural substance that binds tightly to water. Restylane® and Perlane® are dermal fillers composed of hyaluronic acid, and thus attract water into the injected area, providing volume and fullness to the skin and soft tissues of the face. This helps to replace lost volume and restore youthful contours to the skin by smoothing facial wrinkles and folds. It provides a soft, supple correction that provides a very natural result. Restylane is an excellent choice to restore volume in the tear trough, eliminating shadows and hollowness below the eyes. Treatment of this area does require more aesthetic skill and judgement than other areas of the face. This can give patients a more refreshed, less tired look. Patients who are interested in rejuvenation but are not yet ready for surgery are excellent candidates for this procedure. Loss of volume in the face can lead to deepening of the nasolabial folds. Hyaluronic fillers can be used to lift up the fold and restore a natural, youthful contour. Perlane is an excellent choice for treating the nasolabial folds in men. This male patient was treated with two syringes of Perlane. While patients should expect correction to persist at least four to six months, in some patients results from Juvederm® may last up to 1 year. However, this can vary from patient to patient. Radiesse® is a dermal filler that is made of calcium-based microspheres suspended in a water-based gel. It is a very robust filling agent that is a great choice for facial contouring. Like the hyaluronic acid fillers (Restylane® and Juvederm®), it can be used to help soften the lines of the nasolabial folds and marionette lines. It is also very effective in contouring of the cheeks, chin, and jaw line. Radiesse® immediately adds volume to safely contour, correct, and beautify facial features, and continues to work over time by stimulating collagen growth and providing extended correction. In many patients, this extended correction can last for up to one to two years. Radiesse can be used to augment or restore the cheekbones and add volume to the cheeks. The two patients shown here were treated with Radiesse to re-establish a youthful cheek contour. Radiesse is a very popular filler choice for correction of the nasolabial folds. Sculptra® is a product that contains poly-L-lactic acid, a constituent of certain suture materials. While the dermal fillers are best suited for filling in wrinkles and lines, Sculptra® is a product that adds volume to specific areas of the face. It can produce very natural, ‘sculpted’ results in the cheek, temple, and brow, but can be used in many other areas where volume loss has occurred. It is a unique product that it acts like a ‘seed’; after injection, the Sculptra® stimulates collagen production that results in gradual volume inflation of the tissues over a period of weeks. One of the major advantages of Sculptra® is that the result lasts for an extended period of time, up to a couple of years. upper eyelashes. Latisse® users may see results as soon as 8 weeks with complete results at 12 to 16 weeks. The growth is gradual, corresponding to the growth cycle of the eyelashes. If you stop using Latisse®, your eyelashes are expected to return to their previous appearance over several weeks to months. Medical Website Design | Website Design for Plastic Surgeons | Medical Website Marketing by Vital Element, Inc.